The 2005 production from adventure filmmakers Alastair Lee and David Halsted. The film charts the routes of arguably the world's greatest traditional climber - Dave Birkett. 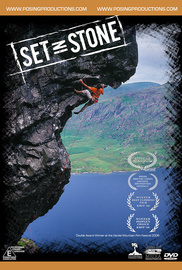 The 2005 collaboration between adventure film makers Alastair Lee and David Halsted has become one of the most significant British climbing films in years. The film charts the routes of arguably the worlds greatest traditional climber - Dave Birkett. SET IN STONE follows Dave's remarkable passion for climbing and the pursuit for a magical line on his beloved Lakeland crags. Featuring the first ascent of 'Return of the King' E9 6c, Dave's latest addition to Scafell's East Buttress - just one of many Lakeland masterpieces including the extraordinary "Nowt Burra Flee'in Thing" (E8 6c) - Cam Crag, Wasdale Screes; a stunningly evocative line. All filmed using innovative techniques, including 'The Brief History of Birkett' animation which covers the 70 year Birkett family legacy. Purchase every single Posing Productions title in this mega value pack. A total of 14 movies for $150 (RRP $230). Best of Brits Climbing Bundle. Purchase this gripping bundle of British climbing films including wild trad climbing, cutting edge bouldering, & the fabled Gritstone. $25 (RRP $70).